I’ve sort of been off Vegas and I think I just got back on. While I was away, they’ve built a city within the city that includes the new Aria/Mandarin Oriental/Vdara hotel complex and the Crystals shopping center, aptly referred to as CityCenter. I was hosted at Aria by my friends at Hearts on Fire (read more about my partnership with them!). My room was brand spanking new and big with all the amenities you could ask for. . . flat screen, sitting area, dressing area, generous bathroom with separate tub and shower etc. Tones tend toward the dark and natural, and bed was super comfy. I walked across the way to the Mandarin Oriental, always a favorite anywhere in the world. Rooms were nearly the exact finishes as Aria so no big difference unless you want to get away from the casino feel (it’s nice not to have to trek a mile through slots en route to your room). The spa is pretty special too. Julian Serrano tapas at the Aria was a surprise. Located off the lobby, it’s arguably not the best location, but that is quickly forgotten with one taste. The ahi tuna tempura with wasabi foam was a standout. The Cosmopolitan has a hidden pizza joint down an unmarked hallway with loud music and a tunnel of album cover photos beckoning you. . . on the third floor next to Blue Ribbon Sushi, it’s sort of like the burger joint in NYC at the Parker Meridian but brighter (and with pizza of course!). The Cosmopolitan also boasts some favorites like LA transplant Comme Ça, Scarpetta (there isn’t better classic spaghetti anywhere), Blue Ribbon and STK. The lobby of the Mandarin on the 23rd floor offers a view of the (replica) Eiffel Tower over classic English afternoon tea. Recommended for the more civilized Vegas experience. Vegas is one-stop shopping. They have everything here! 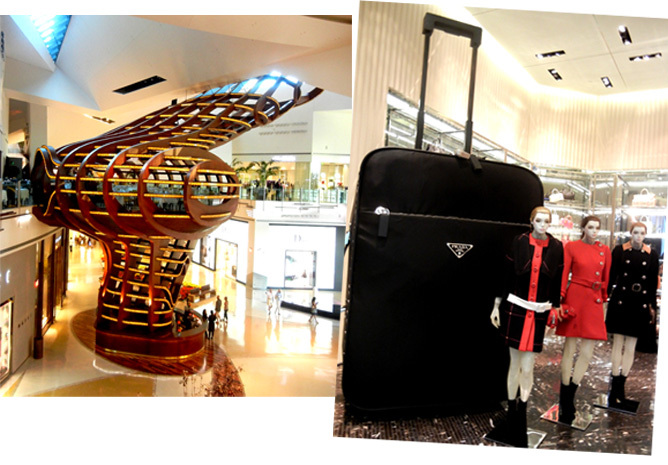 Crystals shopping center is as good as a mall experience gets and is visually stunning. Look for escalators and giant suitcases in the three story Prada store, neons at Balenciaga, and crystal horses at Stella McCartney. Can’t miss the lattice wooden tree house in the middle of it all. My absolute favorite find was the Assouline store. Worth a trip people! In addition to their gorgeous titles, they will custom design your library for you and even deck it out with their custom furniture. Go just to take it all in. Gorgeous! I was excited to see our bags in the Utique machine at the Cosmopolitan. I love this chic new way to shop! Worth checking out if you haven’t seen the future of vending. Fun Fact: cabbies in Vegas are always full of information about the latest news on the Strip. Mine told me about the ‘death ring’ at the pool at Vdara. Not exactly the kind of info I was looking for, but apparently at a certain point during the day, the sun hits all these reflective surfaces and really heats up their pool scene. Guessing SPF 100+ is a must. Looking for style inspiration for your Vegas vacation? Check out my Destination: Vegas collection on ThisNext.com for some fab fashion finds! « DESTINATION: BEST FRIENDS FOR LIFE!